Take a trip to the islands without leaving home. 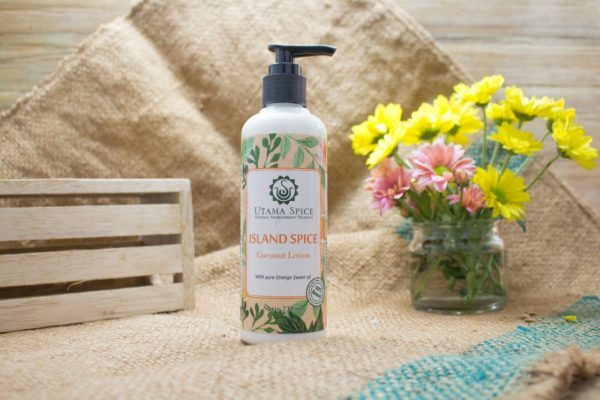 The tropical spice scent will engage your senses and uplift your spirit as you smooth this hydrating lotion onto your skin. Made with natural coconut oil that locks in moisture with a non-greasy feel, lotion absorbs quickly and lasts all day. The addition of natural essential oils like patchouli and frankincense not only provide a rich aroma that lifts anxiety, they contain cell rejuvenating properties that assist with making skin look younger and refreshed. Use in the morning for all-day freshness. • Spicy and exotic uplifting scent.